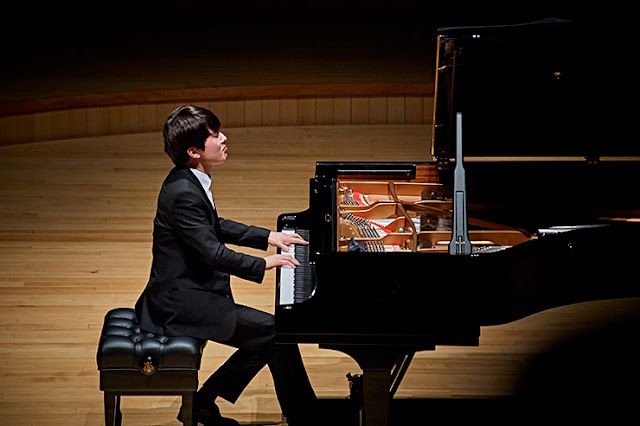 Popular Korean pianist Cho Seong-jin's solo recital at New York's Carnegie Hall scheduled for Feb. 22 (local time) has created much excitement among fans with tickets for the concert virtually being sold out. On the Carnegie Hall homepage Wednesday morning (KST), a day before the concert, clicking on the icon "buy tickets" led to a screen showing all five tiers of the audience seats _ Parquet, Blavatnik Family First Tier, Second Tier, Dress Circle and Balcony _ sold out. Minutes later when returning to the homepage, there were five available seats in two of the tiers, presumably from those who canceled their tickets in the mean time. The screen showed the words, "limited availability." Other than searching online with the eyes of an eagle, there may be chances for locals to grab last minute tickets at the box office where they may sell cancelled tickets. According to fans, there are people flying to New York to see Cho's debut. Cho had said during a press event last year that it had been his lifelong dream to perform at Carnegie Hall since he was young and that he was surprised to hear that his performance will be held in the main hall, not one of the smaller halls. His New York debut will take place at the Stern Auditorium's Perelman Stage at 8 p.m. He will be performing Berg's Piano Sonata, Op. 1, Schubert's Piano Sonata in C Minor, D. 958, and Chopin's 24 Preludes, Op. 28. After winning the 17th International Chopin Piano Competition in 2015, Cho has received explosive attention among classical music aficionados. Tickets for his Seoul concert in January at the Lotte Concert Hall were sold out within minutes.